Does Schrödinger’s cat exist inside the box? If so, is the cat alive or dead? put this ridiculous issue to rest. or come out to interfere with events or convey information. If the device is triggered, the cat dies. Otherwise, he lives. The probability of either event happening is 50%. there when he is not looking at it. By then, however, Einstein had already lost face with the mainstream, so his warning fell on deaf ears. The result is that today the mathematicians explain away every experimental shortcoming of particles with statistics. is subject to the laws of probability. Democracy has no power to change the past. 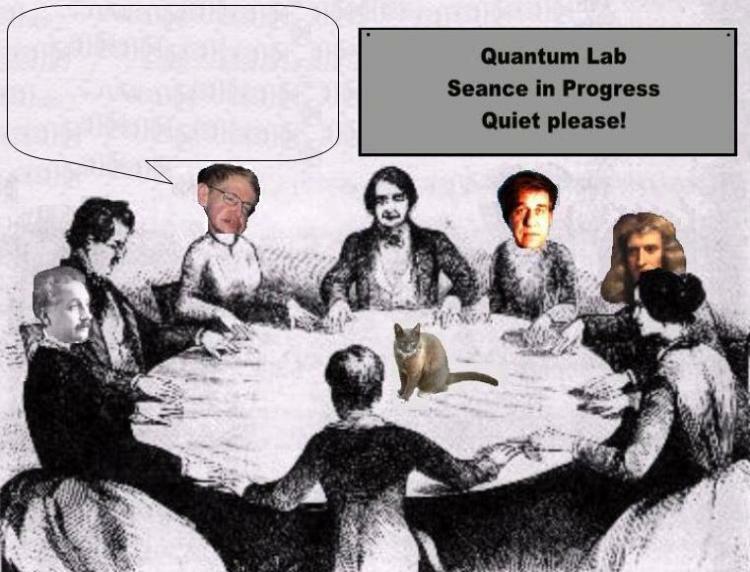 Quantum says so. The cat exists or doesn’t inside the box irrespective of opinions. the categories adjective and adverb precisely. void nor can matter spontaneously cease to have physical presence in space or be phased slowly out of existence. today forms part of a leaf and tomorrow part of you. What exists, exists only in the present. using the word exist in lieu of the verb lived. He is really trying to say that the subject lived some time in the past. dead and alive alludes only to the motion of living entities. A cat may be dead or alive. A rock is perpetually inert. even if everyone in the room is blind. your level of ignorance of the true frequency. You can have an opinion about that because again it is irrelevant. whether Quantum mathematics 'predicts' the true state of the cat when they open the box. Module main page: They don't call it Quantum Magic for nothing! 5. In Quantum, an electron is a bead, a ribbon, AND a cloud all in one! 7. The idiots of Quantum say that when a ball moves, it doesn't stand still ! 8. The idiots of Quantum say that light is both a particle AND a wave ! 9. This page: The idiots of Quantum say that a cat can be simultaneously dead and alive ! There has been a twist to Schrodinger's Cat Theory that accurately illustrates how your tax dollars are ultimately spent. Schrodinger's Cat Paradox. Cat Theory is especially critical to Physics because it has today moved to a new plane. Interpretation of Quantum Mechanics is correct. One individual who spends much of his time researching this ground-breaking issue of physics in his lab is Max Tegmark. pursuit of this Holy Grail? certainly don't want your mind to be polluted with pseudo-science. Epilogue: James Higgo, the author of one of the Many-Worlds papers listed above believed that he was immortal. Unfortunately, he died in 2001. M. Tegmark, The Interpretation of Quantum Mechanics: Many Worlds or Many Words? alive or dead in this universe. 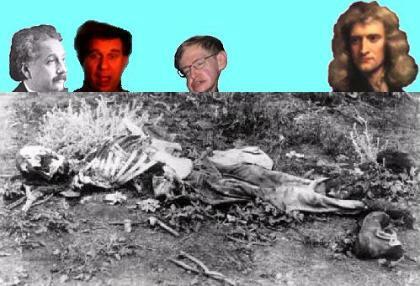 can determine whether our friend is dead.